Eeek! So I got my first paycheck, and what did I do with it? Spent it. Not all… Obviously, duh! Still got leftover lah, considering it’s only midmonth. I must admit, I’ve spent quite bit during the 5-day CNY break. Which was also eeek! What exactly? The couple of cab rides, the Starbucks lattes? NOOO!!!!! Well I am a bit proud of myself because I managed to somewhat budget well. Paying off the things I have to pay off FIRST, loading up my transport card and putting aside money for work lunches. Next, it was buying the essential things like shoes. Yes shoes. I’ve got a sorry collection of shoes I tell you. I had a nice pair of comfy Crocs Adrina Flats which I bought in 2011, and it has now gone so worn. Too worn and dangerous to walk on wet grounds. Bad news although I love it so much, I had to get a new pair but they didn’t have that collection anymore! :((( Tried to get it online but that too was quite sparse – and costly! 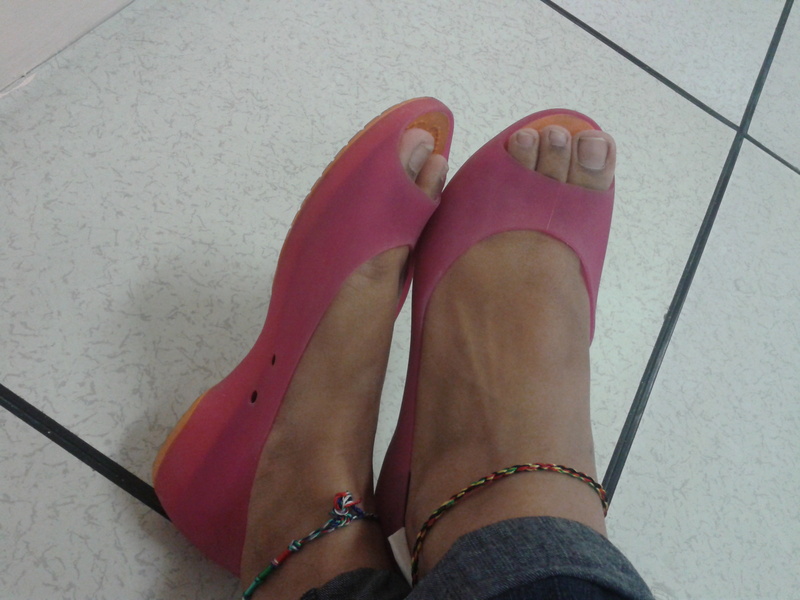 So went back to the Crocs store and got myself a similar pair, Crocs Carlie Flats. Snazzy candy eh? Forgive the feet. I know I need a pedicure soon. $84. I console myself saying that it’s one of the things on my essentials list. I was still ok for the rest of the week. Until I remembered that I had a wedding to attend on the weekend and I have no dress shoes! *Panic! * So I went to shop again, that week. Got myself a nice decent pair of black heels and that’s when the whole ‘I think I should get this too’ thoughts started and I couldn’t keep up with my spending after that.